The Limitorque B320 bevel gear operator not only makes it easy to manually operate multi-turn valves — it also makes it easy to convert to motorized service. The B320 offers torque ranges up to 8,000 ft-lb (10,856 N m) and thrust capacities to 325,000 lbs (1445 kN), for any application demanding a bevel gear operator with superior strength and accuracy. It is most commonly used with sluice/slide gates, gate valves, and globe valves. Trisome has own Innovative Products catering for the Valves automation. 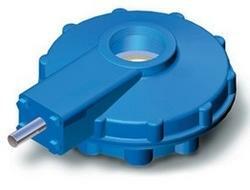 Limitorque’s PT Series worm gear operators are the first such devices designed specifically for motorized operation. When combined with Limitorque’s unexcelled electric actuators (such as the MX, L120 & SMB), the PT provides the user with a dependable, efficient & economical solution for quarter-turn applications. Available in output torques to 100,000 foot pounds (135,591 N m) and in a wide range of operational speeds, the PT is the competitive worm gear operator developed by Limitorque to deliver extraordinary valve control.